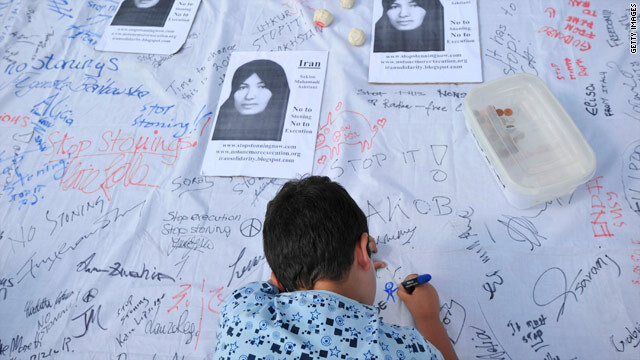 A boy signs a petition calling for an end to stoning during a protest in London on July, 24, 2010, to demand the release of Sakineh Mohammadi Ashtiani. London, England (CNN) -- In a room thousands of miles from her prison cell in northeastern Iran, the fear that has gripped Sakineh Mohammadi Ashtiani for years was clear and almost palpable. "The day I was given the stoning sentence, it was as if I fell into a deep hole and I lost consciousness," said a human rights advocate, reading aloud from a letter attributed to Ashtiani. "Many nights, before sleeping, I think to myself how can anybody be prepared to throw stones at me; to aim at my face and hands? Why?" Ashtiani, a 43-year-old mother of two, was set to be stoned to death for allegedly committing adultery in Iran. Members of the International Committee Against Executions, who have launched a public campaign for her freedom, held a news conference Friday to share a letter they said was from Ashtiani, who is being held in a Tabriz prison, and court documents from her case. "I thank all of you from Tabriz prison," the letter said. Referring to advocate Mina Ahadi, Ashtiani wrote, "Mrs. Ahadi, tell everyone that I'm afraid of dying. Help me stay alive and hug my children." The group also presented court documents it said refuted a July 8 statement from the Iranian government that denied Ashtiani would be executed by stoning. Ashtiani was convicted of adultery in 2006 and was originally sentenced to death by stoning, but the sentence was put on hold earlier this month after an international outcry. Protesters rallied worldwide on July 24 in support of her, pushing for her release. Next week, the Iran judiciary may release their final judgment in the Ashtiani case, deciding whether to reinstate her sentence of death by stoning, execute her by another means, or possibly even grant her a reprieve, according to human rights groups. Earlier this month, her attorney Mohammad Mostafaei told CNN that his client confessed to the crime after being subjected to 99 lashes. She later recanted the confession and has denied wrongdoing, he said. "I am now quiet and sad because a part of my heart is frozen," Ashtiani's letter says. "The day I was flogged in front of [my son] Sajjad, I was crushed and my dignity and heart were broken." Mostafaei himself has gone into hiding since last weekend after being interrogated by Iranian authorities, human rights groups say. Advocates says his wife and brother-in-law are being held by Iranian authorities. "I think it is a very dangerous situation for Mr. Mostafaei," Ahadi has said. "If he were to present himself to the authorities he might receive 10 to 15 years in prison, and I think we must put pressure on the Islamic regime so that his wife and brother will be released." CNN's Nic Robertson and Gena Somra contributed to this report.